Seattle is full of quirky history and culture. It’s the birthplace of Nirvana and chicken teriyaki, and home to a confusing mix of local businesses and behemoths like Amazon, Microsoft, and Starbucks. It’s the most literate city in the country, and has the highest incidence of public library use. Despite its reputation of being rainy AF all the time, it’s actually sunny or partly cloudy about half the year, with lower rainfall amounts than Chicago, New York, or Houston. Weirdly enough, Seattle locals buy more sunglasses than inhabitants of any other city. But Seattle’s identity is slowly shifting. In the last few years, it started to grow and shift out of its prior grunge-filled glory with the rise of technology jobs and influx of young professionals in the region. Despite this, we found Seattleites to be really nice and eager to share tips about their city. 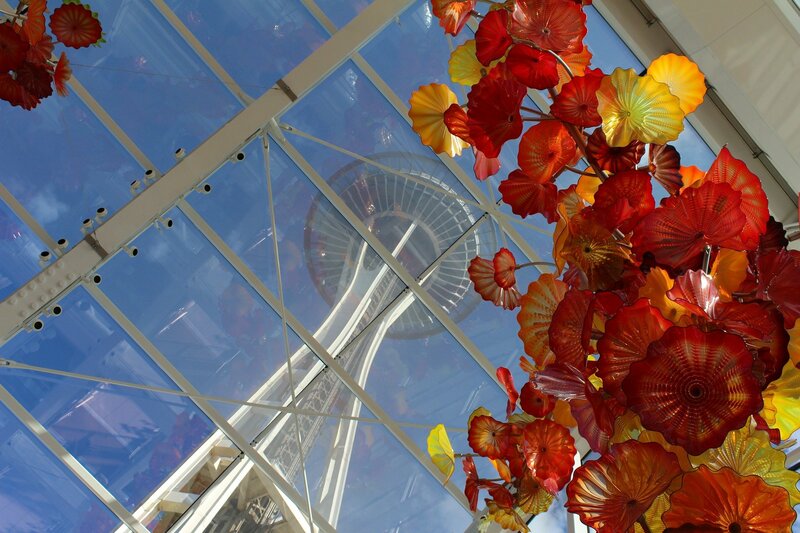 We put this post together to cover our favorite recommendations for a Seattle 3 day itinerary. Because, when you’ve got 3 days in Seattle, do as the Seattleites do: wander the city on foot, eat and drink local coffee, and spend the rest of your time enjoying the great outdoors. It’s cloudy and drizzly for many months of the year, especially in the winter. You can cross your fingers and hope for sun, but plan for rain by bringing some waterproof travel boots and a rain jacket. (We noticed people don’t really use umbrellas there.) Imagine a city full of people dressed like hikers, and you’ve got Seattle. However, it doesn’t get too cold, even in the winter. 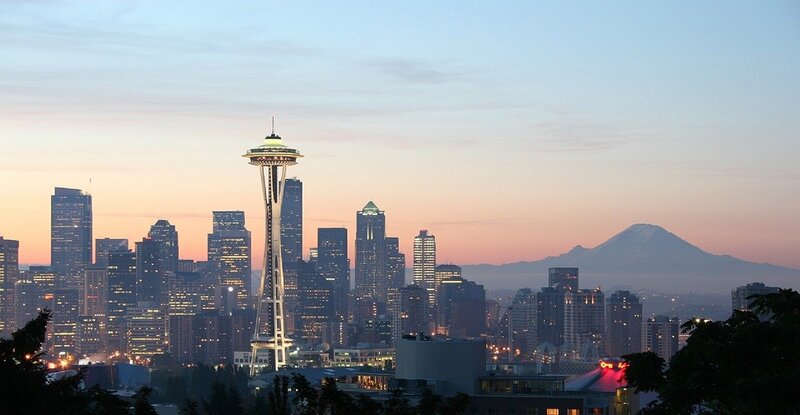 Despite the fact that it’s located super close to Canada, Seattle is protected from blizzards and cold weather due to its proximity to the ocean. You’ll want a lightweight jacket, but we recommend leaving your parka at home. People tend to bike or walk rather than driving. Unsurprisingly, Seattle has the most bikers in any major US city. Needless to say, don’t worry about getting a rental car here – getting around is fairly straightforward. You’ll still find ride sharing apps like Uber and Lyft as well as public transportation, but it’s a pretty walkable city and you’ll want to take advantage of that, especially if it’s nice out. Seattle’s International Airport (SEA) is serviced by most major US airlines and is a hub for Alaska Airlines. Once you’ve arrived at the airport, you can take the Link Light Rail into town. After baggage claim, follow signs to the Link Light Rail and pick up a ticket at the kiosk (~$2-4 one way, depending on your destination). Forget renting a car – it’s expensive, it’s hard to park, and you won’t need one for 3 days in Seattle anyway. To get around in Seattle and the surrounding areas, you can easily use public transportation or walk. In our 3 days in Seattle itinerary, we’ve grouped each day to be accessible solely by public transportation or by foot. No cars needed! If you’re a good biker (we are not…), you can rent a bike at Pedal Anywhere (Address: 611 Eastlake Avenue East, Seattle, WA 98109) and explore the city on wheels. Costs are reasonable and you’ll get the chance to explore Seattle in the greenest and most local-friendly way possible. But for non-bikers, walking and public transit work just as well! For day trips to the mountains or the nearby islands, you can take a public ferry or local buses. You can check the Seattle ferry and bus schedules online, or book a guided tour (more information in day 3 below). As a visitor to Seattle, Downtown is where all the action is. In minutes, you’ll be able to walk from your hotel to major attractions like the Seattle Center, the Space Needle, Pike Place Market, and the Waterfront. You’ll also have easy access to public transportation on the Link Light Rail to and from the airport and around the city, as well as the ferries. If you’re looking for a neighborhood vibe with plenty of coffee shops, restaurants, and nightlife, look no further than the trendy Capitol Hill area. This neighborhood is popular with young professionals and has many walkable areas to get a feel for local life in Seattle. It’s also walkable to most of the major Seattle attractions. Belltown is a lively neighborhood just north of Pike Place Market. Home to a gorgeous sculpture garden and great waterfront views, it’s a fantastic and walkable place to stay. Belltown was formerly an industrial arts district that housed the city’s film industry. Today, there are tons of hotels in this area, and it’s super tourist-friendly, with lots of shops and restaurants. But it wouldn’t be any fun if we gave away all of our surprises…so keep reading for more information on each stop! We recommend following this itinerary in order so that you maximize your walking time and don’t turn around in circles, but feel free to modify the order to fit your needs. 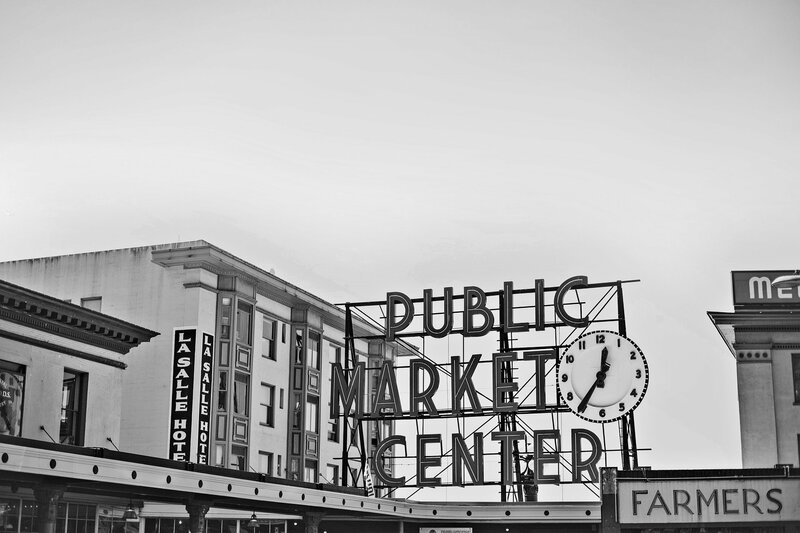 No Seattle itinerary would be complete without Pike Place Market. It’s one of Seattle’s most iconic places to visit, but you’ll usually only see photos of its big sign. Inside, though, there’s a maze of fresh produce, fish, cured meats, international stores, souvenir shops, and artwork just waiting to be explored. You can explore the market on your own, or take a free 1-hour market walking tour with a local guide who can show you all the best spots in the market. While here, you can wander around the building and try some free samples of local seafood, fruits, and baked goods. (We had some smoked salmon and cherries that were to die for…I’m literally drooling as we speak!) You can also grab some breakfast to go while you’re here. What about the original Starbucks? You could also head to the Original Starbucks outside the market, but to be honest, the line was always super long while we were there and it’s really nothing special. 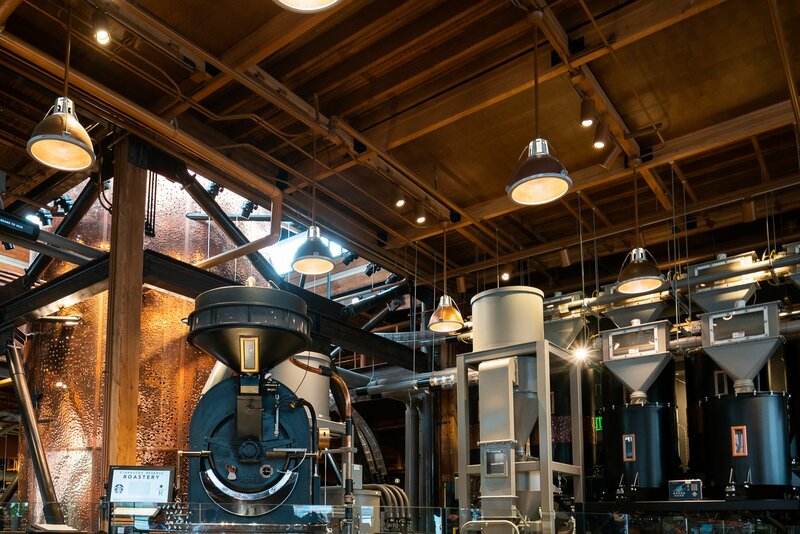 We recommend peeking through the window and snapping a photo here, but heading to the Starbucks Roastery on Day 2 for coffee tasting instead. 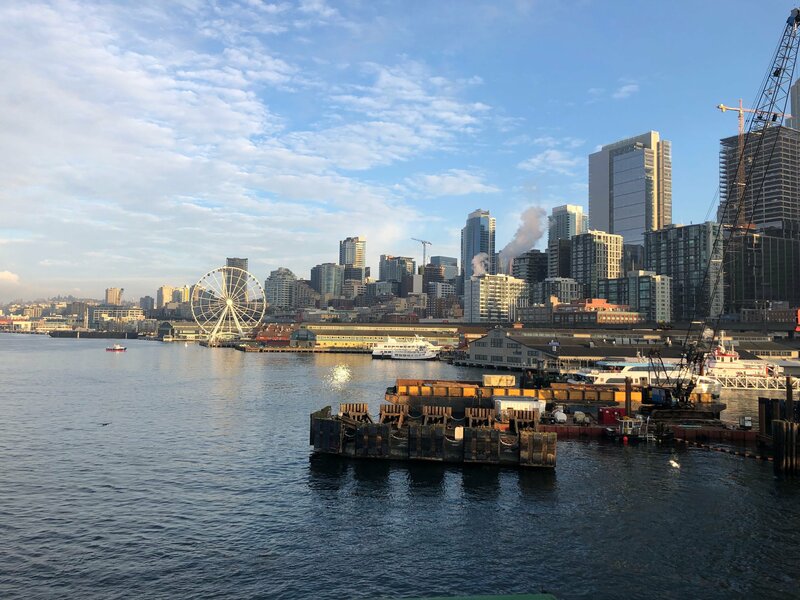 Located right next to Pike Place Market is the Seattle Waterfront, home to the Seattle Great Wheel (the ferris wheel), the Seattle Aquarium, and Myrtle Edwards Park, which offers stunning views of the city. The area is also full of seafood restaurants and shops. 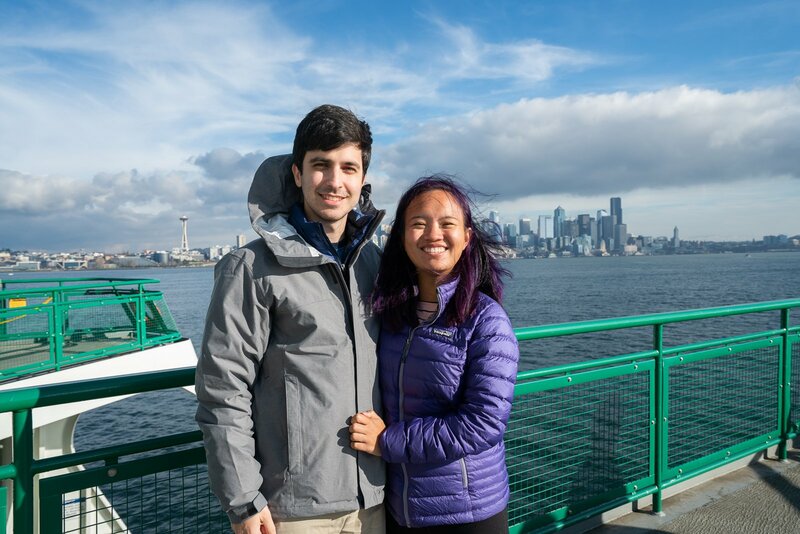 While at the Waterfront, you can also hop on a short ferry ride to experience Seattle from the water. We recommend a quick jaunt on the water taxi to West Seattle, which lasts 10-15 minutes and costs $4.75 each way. On a clear day, you’ll get stunning views of the Seattle skyline and catch some fresh air on the water. Once you’re back from your ferry ride, you can make your way to Pioneer Square. This is the most historic area of Seattle, and many of the attractions here revolve around the city’s strange history. There are tons of cool things to see and explore in Pioneer Square, but since you’re short on time, we’ll just hit the highlights for now. Take the Underground Tour: The Great Seattle Fire happened in 1889 and destroyed half the city. When the city was reconstructed, they built it two stories above the original foundation. The old structures of abandoned shops and buildings remain under the city, and you can explore them on a guided Underground Tour. Pass Through the Waterfall Garden Pocket Park: There’s a super tiny park in Pioneer Square called the Pocket Park that might be the tiniest urban park you’ll ever see. It boasts a 22-foot artificial waterfall and was founded by UPS. Visit an Art Gallery: Pioneer Square is home to 50 art galleries, which represent a variety of eras, art forms, and artists from Seattle and all over the world. Every first Thursday of the month, there’s an Art Walk that includes free parking and admission into the local Pioneer Square galleries. Many cities do some form of an art walk, but Seattle’s was the original and it continues to be a local favorite activity. Grab a Drink at Seattle’s Oldest Pub: The Central Saloon is Seattle’s oldest pub, built in 1892, and is a historic institution in Pioneer Square and Seattle at large. During the Gold Rush, miners used to kick back here and drink after a long day of work. Today, the pub hosts tons of local live bands and musical artists, and is an important hub for the city’s music scene. After the Waterfront, head to the Seattle Center area, which is home to some of the cultural highlights of Seattle, including the Space Needle. While this area might seem touristy, it’s definitely one of the highlights of the city and is worth a visit, if not just to admire the modern architecture and see some of the really unique museums. 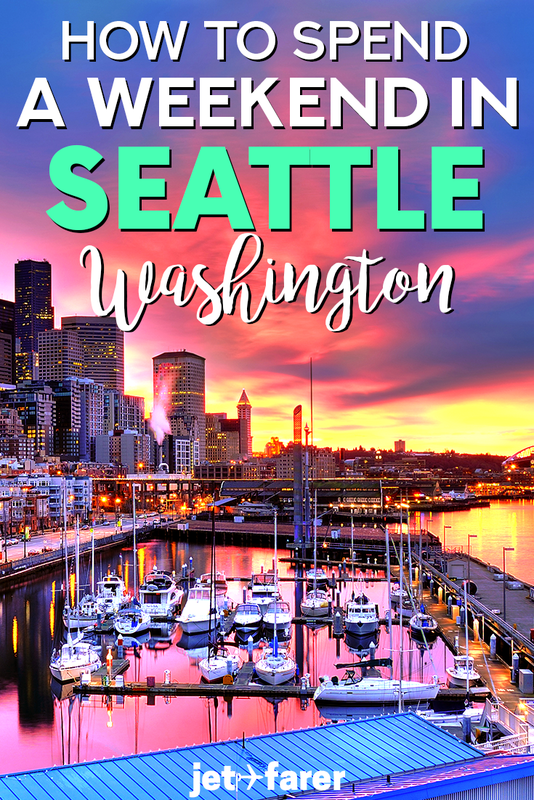 If you decide you want to do all of these things, you can buy a Seattle City Card which includes entrance to several of Seattle’s attractions, including the Space Needle. For lunch or an afternoon snack, head to Dog in the Park, an unassuming hot dog stand near the Seattle Center. Here, you can order a traditional Seattle Dog, which is a normal hot dog topped with cream cheese and sauteed onions. Maybe that flavor profile sounds kind of weird, but it’s actually pretty good. At the very least, it’s definitely one of those strange Seattle things you’ve got to try at least once! One of the best viewpoints in the city of Seattle (and the best way to round out Day 1 of your Seattle itinerary) is at Kerry Park, located in the neighborhood of Queen Anne atop a hill. You’ll definitely get some exercise making the 30-minute trek up here from the Seattle Center area – but the spectacular skyline and Puget Sound views are absolutely worth it. We recommend heading to Kerry Park towards the end of the day, when the sun is low over the water, or at sunset. For dinner, we recommend heading back towards downtown (either walking or using a rideshare service) and grabbing a table at Shaker and Spear, a locally-owned restaurant that specializes in seafood dishes. Fun fact: the restaurant’s head chef, Carolynn Spence, was a challenger on Iron Chef (yup, the TV show)! While here, sample some raw oysters (a local treat that’s fresh from the water!) or try one of their grilled seafood specialties with a side of ginger Brussels sprouts. Wash it all down with a local Seattle beer or a Washington white wine. Buzzing Capitol Hill is the perfect place to kick back with a cup of artisan coffee or wander around in search of a good local bar. It is the heart of Seattle’s LGBT and alternative communities, giving it a very “non-mainstream” vibe. In the 1990s, Capitol Hill was also the epicenter of the grunge movement in the city. After wandering around, you’ll see that this neighborhood values local culture and businesses, and you’ll find a variety of Seattle gems here. Get a cup of artisan coffee: There’s arguably no better place in the city to get an artisan cup of coffee. Sure, you can go with a classic drip, but you can also try strange and unique blends like the barrel-aged cold brew at Starbucks Roastery. There are tons of little coffee shops in Capitol Hill so come ready for some serous caffeine. Stroll through Volunteer Park: This is a cute park with a conservatory that houses many species of plants. Here, you can also visit the Seattle Asian Art Museum, which celebrates Asian contributions to the international art scene in a really unique building. There’s also a great view of Seattle’s skyline from here. Cross a Rainbow Crosswalk: There are 11 rainbow crosswalks in Capitol Hill, painted in 2015 to celebrate Pride. Find one and cross it as you celebrate love and tolerance! Listen to live music: As the home of the grunge movement, Capitol Hill has a few iconic live music venues that you can visit. The Crocodile is famous for once being a host to Nirvana and Pearl Jam, but today you can still catch big names like Macklemore there. Neumo’s Crystal Ball Reading Room is another famed historic music venue that’s hosted artists like Muse and Adele. While in the area, you can stop in at a local record store to catch a glimpse at the city’s musical history. Read a book: Book lovers, rejoice! Seattle’s famous Elliot Bay Book Company is located in Capitol Hill. It’s an independent bookstore that’s basically a wide open room full of amazing reads, plus a coffee shop where you can sit back and bury yourself in a novel. A charming residential area, Ballard was once an industrial town located at the end of a railroad line. Nordic settlers arrived here, drawn by the salmon fishing industry. Today, it’s a riverside community home to lots of breweries, a big park, and other noteworthy Seattle attractions. Watch the Ballard Locks in action: The Ballard Locks were built to enable boats to pass between the various bodies of water in the Seattle area. On a visit, you can see boats move between the sound and the canal via the locks, or take a kayak through them yourself. If you look carefully, you can also see salmon jumping and swimming upstream in this area. Hang out in Golden Gardens Park: This is one of Seattle’s larger parks, and there are trails where you can hike to waterfront beaches or forests – take your pick! On clear days, you can take in the stunning views of the Cascade Mountains nearby. It’s also a great place to watch the sunset. Visit the Nordic Heritage Museum: Much of Seattle’s history and population come from Nordic settlers, who arrived in the area in the 1800s. This museum details the history of the Nordic people in the Pacific Northwest and their influence on Seattle’s culture. Go to a brewery: There are tons of craft breweries in the Ballard area, in true Pacific Northwest fashion. You could literally spend all day hopping from brewery to brewery. We recommend trying the award-winning Hop Tropic at Ruben’s Brews. If you thought the rest of Seattle was alternative and strange, wait until you get to Fremont. Filled with artwork, markets, and local businesses, Fremont proclaims itself as the “center of the universe.” It’s one of those places you’ll have to see to believe. Within Fremont, there are tons of things to see and do. Some of the city’s best restaurants and bars are here, and there’s of course the offbeat art scene. See the odd artwork: There are lots of unique sculptures all over the Fremont streets, including a troll, a Lenin statue, and the “center of the universe” guidepost. You can also learn about Fremont’s quirky history and see its strange public artwork on a 1.5-hour guided walking tour, led by a local expert. Peruse the Fremont Sunday Market: Want to find strange handcrafts or antique gems? Look no further than the Fremont Sunday Market, which basically has a little bit of everything. It’s an enormous market where you can find all kinds of odds and ends, sold by a variety of local vendors. Eat and drink at local haunts: Fremont’s food scene is awesome. There are lots of local businesses where you can eat and drink to your heart’s delight. Indulge in delicious free-trade chocolate at Theo Chocolate. You can also take a tour of their chocolate factory, ya know, Willy Wonka style. Once you’re done with chocolate, you can grab a meal at Eve Fremont or RockCreek Seafood & Spirits. I was debating adding this one in here, but I figured since I enjoyed it while visiting, it was worth a mention. South Lake Union is where Amazon’s HQ is, and therefore it’s pretty office-like and corporate. However, there are TWO attractions of note here that you should definitely keep on your radar when you visit! Hang out at the REI Flagship store: OK, OK. This might be because I LOVE REI, but I definitely spent a few hours perusing their gigantic flagship store in South Lake Union. They’ve got everything you could ever want for outdoor adventures, plus a rock wall! Visit the Seattle Spheres: Amazon created the Seattle Spheres, which are giant glass golf balls full of plants and greenery, and they’ve become somewhat of a famous attraction in the city. While they’re specifically for Amazon employees, on certain weekend dates, non-employees can visit the Seattle Spheres too! Raf and I riding the ferry to Bainbridge! Seattle is surrounded by beautiful mountains, sparkling water, and parks for days, so it would be a shame not to explore some of the surrounding areas during your time here. There are a variety of activities you can do within an hour of Seattle’s city center, ranging from touring an airplane factory to hiking to a 360-degree viewpoint. There are TONS of hikes in the Seattle area, ranging from easy trail walks to difficult technical hikes. I recommend coming prepared for rain or drizzle with a waterproof shell and hiking boots. Here are a couple of the most popular hikes in the region – perfect for a day trip from Seattle! Mount Si (8 miles) – One of the most iconic hikes in the Seattle area, this moderate trail leads up to a stunning viewpoint of the surrounding mountains. Mailbox Peak (9.6 miles) – Mount Si’s more difficult cousin, Mailbox Peak offers panoramic views of the entire mountain region near Seattle. It’s pretty spectacular. Twin Falls (2.6 miles) – An easy, family-friendly hike leading to a waterfall. Perfect for non-hikers or people who want a shorter trail to hike. Rattlesnake Ledge (4 miles) – A popular trail leading up to a cliffside with views of a stunning lake and the forests and mountains surrounding it. Wallace Falls (5.6 miles) – A leisurely trail that leads to a series of pretty waterfalls amidst tall evergreen trees. For most of these hikes, you’ll need to rent a car. However, most of these trails are around 30 minutes from the city, so they’re pretty easily accessible. You can also visit Mount Rainier itself by car or on a guided day tour from Seattle. Ever wondered how an airplane is made? Book a guided Boeing factory tour and head to the Boeing Aviation Center to learn about the manufacturing and production processes for aircraft. You’ll get to see how the planes are made and meet the staff who do it every day. It’s an engineer’s dream come true!